Wal-Mart shares are tanking after the company’s executives called February sales a “total disaster.””Have you ever had one of those weeks where your best-prepared plans weren’t good enough to accomplish everything you set out to do?” Wal-Mart exec Cameron Geiger wrote in one of the emails reported by Renee Dudley at Bloomberg. “Well, we just had one of those weeks here at Walmart U.S. Where are all the customers? And where’s their money?” Geiger asked. Wal-Mart is facing a scary reality: the ailing finances of its core customers, Brian Sozzi, chief equities analyst at NBG Productions, told us. 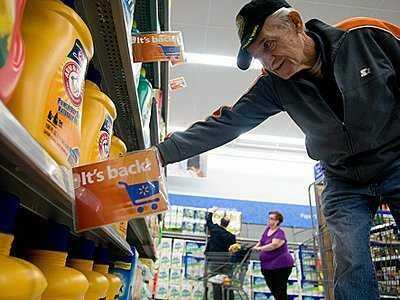 “The fundamental health of Wal-Mart’s customer is concerning,” Sozzi said. The numbers Wal-Mart reported at earnings reveal a troubling trend. Traffic is nearly flat from a year ago, and Sam’s Club executives said that customers aren’t shopping as much. The Wal-Mart executives blamed the hike in payroll taxes and a delay in tax returns for why customers aren’t shopping, according to Dudley’s story. Wal-Mart CEO Mike Duke told Women’s Wear Daily last year that his customers weren’t confident in the economy.